for his fiancee, Savannah jumps at the opportunity. before her assignment is completed? this time, a battle of the heart. by the two most important women in his life. and find closure with his true love? Abigail Clayton hopes to reconcile with Dr. Wade Bennett and become his wife. so the plantations of the two families will be joined. and the yearnings of her own heart. Besides, she harbors a secret love for someone else. and each story is beautifully written. with rich history and tender romance. and that is Love Beyond Limits by Elizabeth Musser. with many twists and turns that caused my mouth to fall open in surprise more than once. The author also did an amazing job of presenting the terrifying history from 1868. My heart broke as I was reminded of the pain and heartache that took place back then. I appreciate the work of each author and the way they presented our nation's history. into their characters lives and for that I am truly grateful. 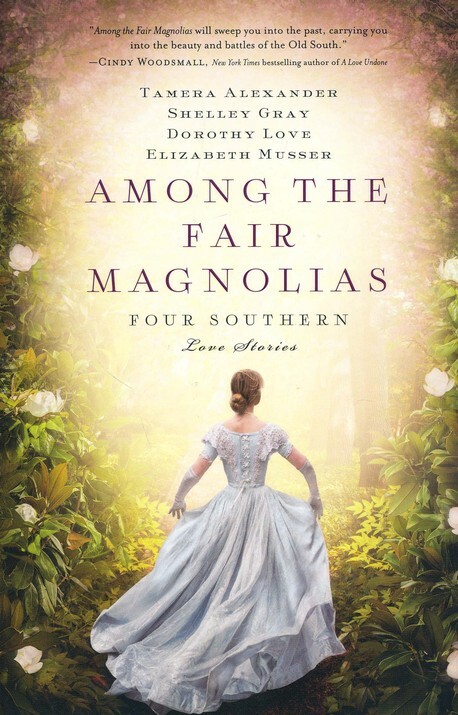 Among The Fair Magnolias is certainly a book worth reading. You will be encouraged spiritually and inspired by the romance of each character. GOod morning gentle soul! YOU have been busy with reading! There is nothing quite like storytelling, is there? Though summer vacation is quickly ending for me, storytelling has to remain in my life. In fact, I need to always remember that my job as a language teacher is a great segway to keep my students' progress meaningful, through storytelling, whether it's by reading or creating stories. I'm going to look for this. I've been reading a series by Colleen Coble that takes place just after the Civil War and I've enjoyed it very much, too. Thanks for the recommendation. Have a sweet week, dear Stephanie. the cover of this book is already all a program and the words you write about it are truly an invite to read it as soon as possible ! I wrote down this title, I promise I'm going to buy it also, I cannot anything but do it, for my husband's joy who goes on finding new books everywhere at home, poor darling !!! I have seen this book promoted in several places and each time I am determined to find a copy. I didn't choose to review it because of time constraints, but I can see from your review that I am going to have to search out a copy soon! Lilla Rose Review And A GIVEAWAY!